"Bringing up a family should be an adventure, not an anxious discipline in which everybody is constantly graded for performance." This quote caught my eye because it had to be the motto my parents chanted as they raised four (very different) children. My childhood was an adventure (in the best sort of way), and at every critical turn, my parents encouraged me and led by example. They never compared me to anyone else and they didn't expected perfection. Mom and Dad saw in me a strong-willed, defiant child that, if handled properly, had some sort of untapped potential. At age 15, all that I saw was everything that I did not have: the height of a volleyball player, the beauty of a cheerleader, that new BMW that my neighbor was given on her 16th birthday, or a pair of those fancy designer jeans that taunted me in the halls of my high school. Looking back, my parents offered me something that money could never buy; they gave me experiences that ultimately gave structure to the story of my life. My story is constantly being written, but I am finally seeing some sort of definition. I was on an airplane at six months, and as Mom and Dad traversed the world, I traveled with them to over 50 nations. They taught me to see beauty in every culture and to love people, and I quickly got very comfortable living out of a suitcase and sleeping on someone's living room floor. Me and Dad at Plato Books in Subotica, Serbia. When Dad dropped in to see us in Subotica, Serbia, I was hardly shocked. After all, he surprised me in Kuala Lumpur, Malaysia when I was volunteering there, and then again in Singapore to see the musical I was casted in. He had never been to Serbia and his daughter and son-in-law were a perfect excuse to check the country off his list. The Serbian snow hindered us from traveling much, so we made the most of our time in Subotica. Of course our first stop was Plato Books, and Dad just had to try their tiramisu. It passed his taste test, but it wasn't better than the homemade stuff Mom makes! We played football in the snow . . . . with a tennis ball (why not)! 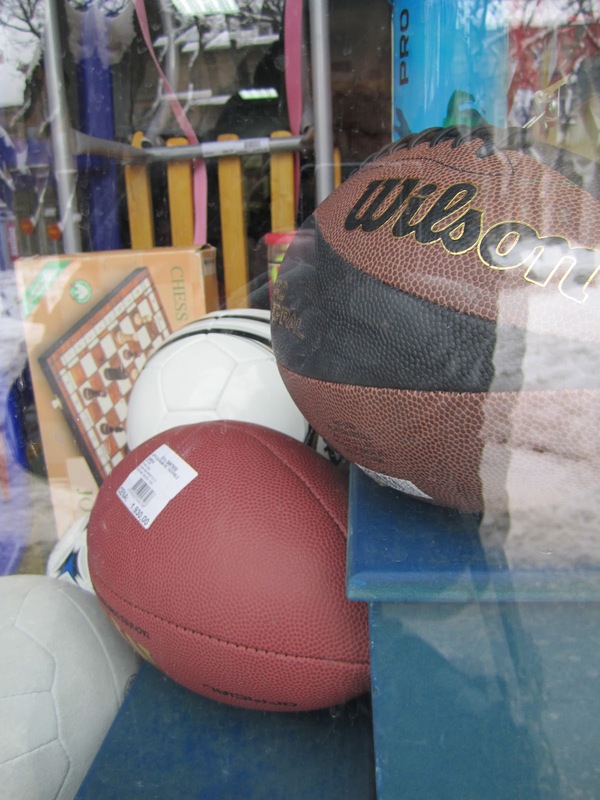 For weeks I had tried to find an American football in Serbia, but every sports store came up empty. Oh well, a tennis ball still made for a good game, and my team won so that sweetened the deal! As we left the game, we found an American football not 100 yards from where we were playing! After a high-stakes game of American football (played with a tennis ball), we took Dad out to our favorite little Italian place, Pizzeria Denis. When I noticed tiramisu on their menu, I knew what we were having for dessert. It was worth every extra calorie, but is still was not as good as Mom's! Dad celebrated his birthday with us in Serbia, and it was nothing short of memorable. All of our friends brought gifts and baked goods for a man they had never met. I was so touched by their thoughtfulness, and I know that Dad was too. Every time our friends come over, I pray that their generous spirit rubs off onto me. While Chris and I enjoyed a lovely dinner with a member of my family (Dad), I couldn't help but feel a special sort of bond deepening between us and our Serbian friends. It almost felt like family. . . . and maybe because of the lessons of my childhood, I was discovering something extra beautiful in Serbia. It doesn't matter that I don't have a clothes dryer, ziplock bags, MAC makeup, Starbucks Coffee, my own car, or Forever 21 in Serbia, because I have found something that means so much more than all that "stuff." The friends we have made in Serbia are more valuable than all of the things money can buy. Maybe Mom and Dad were really onto something when I was 15 and begging for a new BMW. They said NO and reminded me that I was so "rich" and blessed to have good family and friends. I am so glad they never were able to give me that BMW. Wow! What an honoring blog! Mom and I are deeply blessed with all you wrote. Thanks, sweetheart! I so appreciated the time we spent together. Please express my deep appreciation to your awesome friends for the time we had together. I love you guys! yes the strenght of Serbia is in her people. All of our beauty is concetrated in them. La Leche - Thank you for the comment! I would LOVE to meet up some time in Belgrade! Once the weather gets better, I will be in Belgrade more often. Thanks for reading! It's Beginning to Look a lot Like Christmas. . .